In my address, I intend to dwell mainly on two issues: The new prospects for civil nuclear energy, and the risks associated with it. The risks include diversion of nuclear materials to military programs; nuclear terror; and safety and security of nuclear installations. The nuclear industry has recently begun witnessing the emergence of a world-wide renaissance. While the intensive development of nuclear energy is highly desirable, it is imperative to minimize proliferation risks – especially risks which are associated with nuclear fuel cycle technologies. The characteristics of these technologies are that they are inherently dual use in their nature. It is the firm view and the policy of Israel, that the right to use nuclear energy for peaceful purposes is based on the absolute duty of each state not to abuse this right. IAEA, repeatedly mispresented Israel’s long standing policy in this regard. The continuous growth of Israel’s energy needs, coupled with its total dependence on foreign energy sources, poses a complex national challenge. Israel possesses advanced nuclear expertise and know-how that will play an impressive role when it comes to the future development of Israel’s energy sources. I would like to address Israel’s vision and policy, regarding the transformation of the Middle East to a zone free of weapons of mass destruction. It has always been the position of Israel that the nuclear issue, as well as all other security issues, could only be realistically addressed within the regional context. The African Nuclear Weapon Free Zone Treaty, which has recently entered into force, provides an excellent example of such an approach. It is our vision and policy, to establish the Middle East as a mutually verifiable zone free of weapons of mass destruction and their delivery systems. We have always emphasized, that such a process, through direct negotiations, should begin with confidence building measures. They should be followed by mutual recognition, reconciliation, and peaceful relations. Consequently conventional and non-conventional arms control measures will emerge. Israel’s long-term goals for Middle East regional security and arms control were approved by the Israeli Government. As the international community has accepted and recognized in other regions, the establishment of such a zone can only emanate from within the region. In our view, progress towards realizing this vision cannot be made without a fundamental change in regional circumstances, including a significant transformation in the attitude of states in the region towards Israel. The constant efforts by member states in the region to single out the State of Israel in blatantly anti-Israeli resolutions in this General Conference, is a clear reflection of such hostile attitude. Significant and grave developments regarding nuclear proliferation have taken place in the recent years. I want to emphasize, that the most widely recognized cases of non-compliance with legally binding non-proliferation obligations, have occurred in the Middle East, by states that are parties to the NPT. Grave and covert violations by Iran and Syria had been detected and then formally reported by the IAEA. The Agency’s investigations in these two countries have been hampered by continued lack of cooperation, denial of access, and efforts to conceal and mislead the inspectors. Israel is following these developments in our region, with profound concern. We all hope that the IAEA investigations will get to the bottom of these activities. In so doing it will assist the international community in its efforts to prevent dangerous proliferation of nuclear weapons, and the abuse of the right to peaceful nuclear energy. We believe that it is crucial to improve and enhance the IAEA verification and inspection capabilities. We are also of the firm view, that IAEA investigations should be conducted free of any extraneous influences. Above all, the activities of those countries that breach their international commitments and obligations must be met with concrete and immediate international measures. Violations cannot go unpunished. Another important issue, which poses many challenges to the international community, is nuclear safety and security. Adequate safety and physical security measures are crucial to ensure international acceptance of the nuclear civil industry. 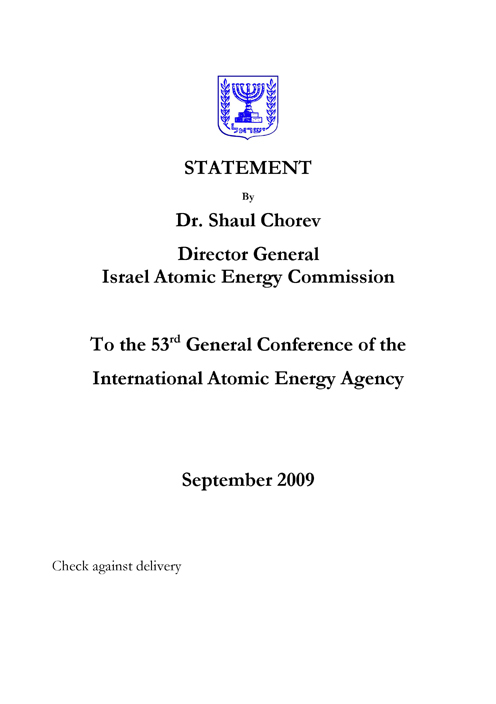 It is the long standing policy of the Israel Atomic Energy Commission, to pursue uncompromising standards of safety in its two nuclear research centers. Given the global realities we all face, the peaceful uses of nuclear energy, should have been the main topics of this Annual General Conference. Regrettably, instead, some countries are imposing on this General Conference politically motivated agenda items. These efforts are either designed to single out the State of Israel, or to divert attention from violations and real issues of non-compliance by certain Middle East states. for pursuing policies designed to secure its very existence. The second is agenda item 21 entitled: “The application of IAEA Safeguards in the Middle East”. Israel has joined the consensus on this Agenda Item for 14 consecutive years. We have done so notwithstanding our grave reservations, regarding the modalities included in the resolution’s text, and the relevance of this forum in addressing the establishment of the Middle East as a nuclear weapon free zone. As I mentioned before, such a zone can only emanate from within the region on the basis of arrangements freely arrived at through direct negotiations, between all the states concerned. No IAEA Forum could replace direct negotiations between the regional parties. Unfortunately, since 2006, the consensus on the Middle East issues was broken. The only reason for this setback is the uncompromising attitude of the sponsors of these two draft resolutions who are aiming at extraneous political goals. This raises also doubts whether the promotion of the Middle East into a nuclear weapon free zone, is indeed the aim of the sponsors. During recent months, Israel has approached Egypt directly and through other Governments, hoping to reach an agreed language on Middle East issues in this General Conference. In the same spirit, Israel has responded positively in the recent days to sincere efforts by several delegations and the President of the Conference to work together towards a positive outcome. It is my firm belief that it is not too late to reach consensus based on our respective positions. I can assure you all of our fullest cooperation in trying to reach consensus based on negotiations in good faith. Iran’s initiative to promote Agenda item 24 on “The Prohibition of Armed Attack or threat of Attack against Nuclear Installations” is a clear case of hypocrisy. Iran is driven by wishful thinking, that the international community will condone Iran’s violations of its commitments and obligations, and its deception campaign over many years. No diplomatic smoke screen and maneuvering in the IAEA’s General Conference can obscure the real facts and findings. Let me remind all delegates that the Director General, in his recent address to the Board of Governors, provided an account of Iran’s non-cooperation with the Agency and said: “If this information is real”, “there is a high probability that nuclear weaponization activities have taken place”. The Government of Israel and many others assess, that the information available to the Agency is accurate and real. Iran, which is systematically violating several United Nations Security Council Resolutions, is seeking the sympathy of the same international community whose authority it flouts. I call on all delegations, to reject Iran’s transparent and cynical move. The international community is at a critical crossroad in confronting a fundamental challenge. We should work together in promoting peaceful uses of nuclear energy, while preventing the spread of nuclear weapons and proliferation of sensitive technologies and materials. This coming Friday is the eve of the Jewish New Year 5770. In our prayers we say: “Here ends a year with its maledictions and a new year begins with its blessings”. We hope that this year holds blessings and peace for all.